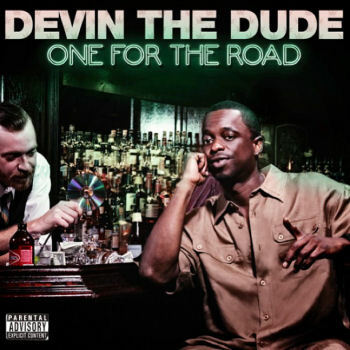 RapReviews.com Feature for January 7, 2014 - Devin the Dude's "One For the Road"
For those not up on Devin the Dude, he's a fellow graduate from Cypress Hill's high school. He's not just a dope rapper, but a dope rapper. OK we get it, Devin raps about his drug habit and whilst this may seem like limited subject matter, he's damn good at it. However, getting a guy who doesn't smoke weed to review a Devin the Dude album is a bit like asking for a sober perspective on an Alkaholiks record. There'll be some strong relations to the music, but you can't fully experience the message as it was intended. Yet, I disagree with this sentiment no matter how much I understand the viewpoint. Not only would that severely limit Devin's fanbase - but there's no doubt that many hip hop fans first heard Devin on Dr Dre's multi-platinum selling "2001" album which itself was heavily influenced by being under the influence. I doubt every one of those consumers was a stoner, in fact I knew a whole group of guys that DIDN'T smoke marijuana in their teens yet absorbed plenty of Cypress Hill albums, myself included. But then, I also grew up on Wu-Tang Clan and Mobb Deep and I'm (so far) no more likely to swing swords or stab people in the face with their own nosebones. So passing judgment on Devin the Dude's latest album "One For The Road" won't be judged on the fact that Devin has a long history with hip hop that's notably hefty on the chronic, kush or skunk. From the outset, "One For The Road" is evidently laid back. "I'm Just Getting' Blowed" is as crisply produced as anything from Andre Young himself (although includes an irritating sound that happens to be the same as the Windows PC pop-up noise) - Devin's effortlessly chilled rhymes help hold together an admittedly excellent instrumental with some top notch saxophones. It's the nuances that separate Devin from any other rapper that show he isn't making money from the glorification of smoking marijuana. For Devin, it's a lifestyle-choice much in the same vein as having a few drinks is. On "I'm Just Gettin' Blowed" he discards the differences between a cigarillo and a blunt all the while fretting about his stash that's left in his car. The initially morbid "Stop Waitin' (To Die)" is actually a reminder that even when you get older and become more likely to be lonely, keep doing what you want (further emphasised on the following song "Reach For It"). Time is limited, much like the longevity of a lit blunt. Songs like "Reach For It" showcase Devin's renowned nasal singing ability, but also highlight how strong a presence he is. The guest vocals from Snap are a bit patronising despite being exactly what the song is about - uplifting intentions. It feels forced however, whereas Devin's combination of rapping and crooning is frequently natural, and a match made in heaven. Other collaborations are similarly underwhelming with Angela Williams' contribution on "Livin' This Life" failing to mesh well, sounding distant and almost as if two songs were forced together. "One For The Road" is at its best when Devin is left to his own devices, with the infectious "Probably Should Have" being a prime example of this. There's flirtations with R&B on "Hear The Sound" and "Rearview", both undeniably catchy and neatly produced, showing Devin's versatility as well as a knack for sophisticated, mature instrumentals. This is definitely a grown-up piece of hip hop, particularly when it comes to the choice of production. The song "One For The Road" is actually an instrumental that was just TOO good to put words to, instead seeing Devin croon the phrase ‘one for the roooooad' every now and then. The album closes with the hypnotic "Please Don't Smoke Cheese" and an 80s throwback track called "Herb The Nation", the latter showing off Devin's sense of humour and tongue in cheek approach to politics (‘you do your thing but we smoke weed, we are here to herb the nation'). I can't knock it, Devin is having fun whilst maintaining his remarkably consistent discography and no matter what gets you high, whether it be cannabis, alcohol or a mug of cocoa, you'll enjoy "One For The Road" regardless of intoxicant.